Every trader or an investor wants to achieve the best every day stock trading results. These results and expectations are based on a type of each trader. A pattern day trader wants to make money every month to be independent. Active investor or a trader making position or swing stock trading could be satisfied with profitable quarters or half years even if some month will not make gains. Every beginner who learns to trade shares thinks that he must make only profitable trades to make money. To have the best possible results. But it is not true and it is also not possible to make only profitable trades. There are trades that are closed with a profit and there are trades that are closed with a loss. But the size of the outcome is the key. regardless of reaching the target. Such result in your trade means that your trade exceeded your profit expectations. Every trader has trades like these every year. These trades often move the size of the trading account to a higher level. This is worst possible result of online trades. This type of stock trading results must be avoided. Trade finished with a big loss is often not well managed. Such results in trades signalize that trader does not use his/her trading rules or that there are not any rules defined in trading business plan. What are the key steps to avoid big losses in intra-day or swing stock trading? To avoid these bad results of traders? The first is realization of losses. It is not possible to trade or invest without losses. There are losing trades and there will be losing trades. This is more psychological aspect than anything else. Every trader must understand that there are profitable trades and there are losing trades. Every trader should accept this. The second step is to avoid big losses. Yes, when we look at the list of possible trading results described above, the most important is to do everything to avoid big losses. These losses will come when a trader or investor does not follow his rules. When the trade goes against him and turns into a loss and he fails to exit such trade. In this case a short-term trader often become long-term investor who hopes that something will happen in the future and he will be able to sell his position for a break-even or a small profit. Most often than not it will not happen. And former trader finishes his trading as his account is buried by such huge losses. All based on bad results of his/her decisions. 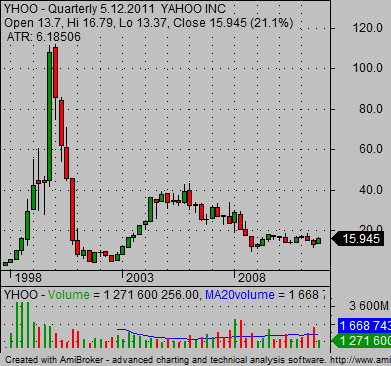 Just check this chart of YHOO stock. If trader did not apply a stop loss during the Internet bubble in 2000 then he has not seen prices above 70USD yet. It is possible to define two key terms that should help to improve every day stock trading results. All based on the example above and definitions. The trader’s business plan is first one. This plan should describe all important trading rules that have to be used in every-day activities on the market. The second key term is a stop loss. A stop loss is a part of a trade management process that helps to achieve the best stock trading results.